The AAM Research & Publications Committee provides leadership and volunteerism to manage the production of AAM surveys throughout the year. Each of our surveys is available to members and non-members, offering keen insight and market data to support growth, business development and marketing initiatives. 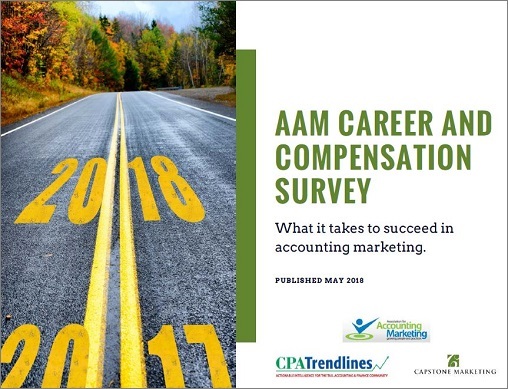 AAM has partnered with the Capstone Marketing and CPA Trendlines to conduct our study of compensation trends for accounting marketers. Participating firms were asked to submit compensation data for the marketing team (inclusive of business development team members). This compensation data was combined with marketing department and marketer-specific data provided by individual marketing professionals to ensure accurate, unbiased compensation data. AAM and Hinge have partnered again to bring you the third edition of the Accounting Marketing Budget Benchmark Study. This definitive report provides a wealth of information that’s available nowhere else. Learn how much firms across the nation spend on marketing, how they allocate their budgets and how marketing priorities are changing. This study is an essential resource for any accounting firm principal or marketer. Members will receive a $300 discount. Become a member today! During August and September 2015, the Association for Accounting Marketing and Inavero conducted a benchmarking study of compensation trends for accounting marketers. This report collects the study’s findings. 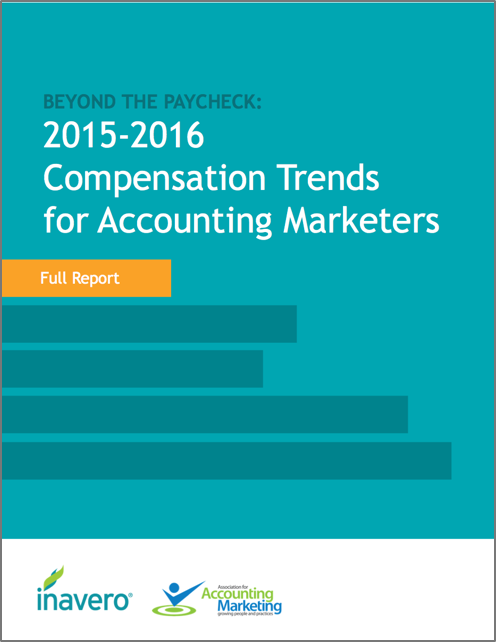 This is the industry’s most comprehensive report of accounting marketing compensation trends and benchmarks. The study gives insight into how your compensation stacks up against your peers, along with what accounting marketing departments are doing to stay competitive and attract top talent. In the first quarter of 2015, the Association for Accounting Marketing and the Hinge Research Institute conducted a benchmarking study of marketing spending and organic growth among accounting firms. This report collects the study’s findings. 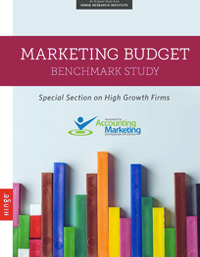 Results represent an analysis of accounting firms’ marketing budget compositions and budgeting processes, as well as perspectives from respondents on changing marketing spending priorities. This data is further contextualized by comparisons of firms’ marketing spending according to growth rate, size, and market reach. Various other indexes, such as the ratio of marketing staff to overall employees, were also calculated. The Association of Accounting Marketing and Hinge Research Institute have joined efforts in a new research study examining marketing spending for accounting firms. The study examines overall marketing spending, including compensation for marketing staff, the top five spending categories and detailed budget breakdowns by firm size and market location. Participants in the survey represent a wide range of accounting firms across the United States with budgets ranging from less than $4.9 million to more than $114 million. A key aspect of the study highlights marketing strategies most widely used and successful for high growth firms. A special section showcases this information to help marketing professionals prioritize tactics within their strategy more effectively. Included in the report is a budget worksheet to establish a basis for comparison to industry benchmarks. A full report can be purchased. Members will receive a $300 discount. Become a member today! As accounting firm leadership expands to include dedicated marketing and sales professionals to supplement the partners and managers in generating new clients and engagements, the question arises, “What marketing and sales roles do we need and when?” This document is intended to answer this question and provide guidance regarding the various marketing and sales roles a firm may have, how these roles may be measured and the timing you may consider when adding these positions in your firm to achieve your business development goals. Compensation considerations will not be included in this document as the Association for Accounting Marketing plans to conduct a survey in the next year to gauge marketing and sales compensation trends among members.